Following our Perth Zoo trip we headed a few minutes walk up the road to the Windsor Hotel which sits majestically on the corner of Mill Point Road and Mends Street for a welcome lunch! 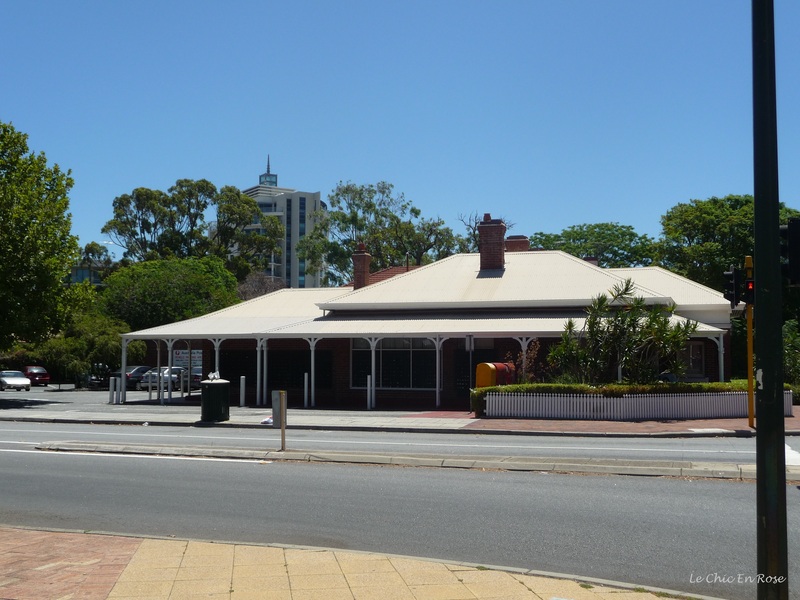 This local South Perth icon dates back to 1898 and whilst the interior has been modernised, the facade has changed little since it was first built in the late nineteenth century. It has a front bar, a restaurant and a beautiful outdoor seating area with plane trees and vine covered pergolas providing excellent shade and we usually make a point of repairing here afterwards if we are visiting the zoo. Like many other customers we normally prefer to dine al fresco in the pretty garden with its dappled sunlight and water features. The little bridge over the water feature is very popular with small children so be prepared to supervise! However since our little granddaughter La Petite had finally fallen asleep after running us ragged round the zoo, on this occasion we opted for the tranquility of the indoors restaurant. 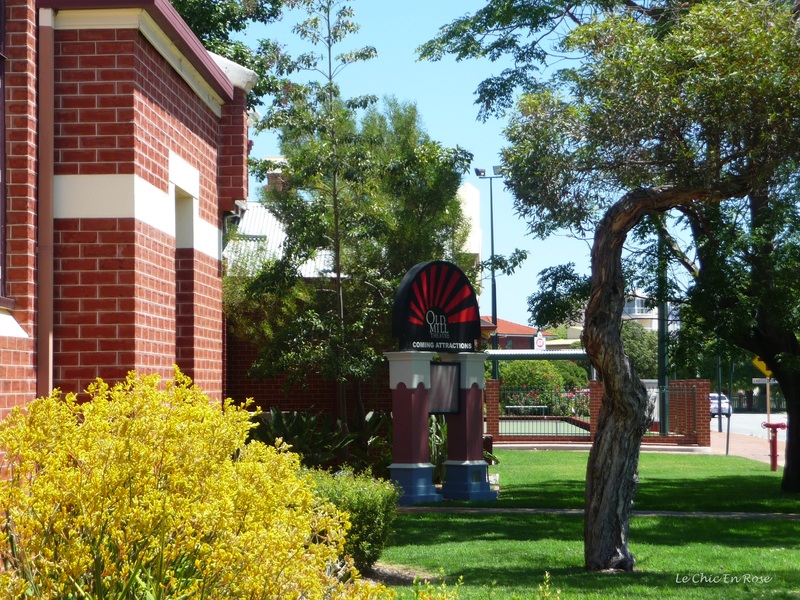 The charming streets in the Windsor locality are part of the City Of South Perth Municipal Heritage Inventory and provide a pleasant contrast to the bustling Perth City Centre on the opposite side of the Swan River. South Perth was one of the first settlements to be established following the founding of the Swan River colony of European settlers in 1829 by Sir James Stirling. It was an important site for the indigeneous Noongar People who had lived in the south west part of what is now known as Western Australia for at least 45,000 years before the arrival of the first Europeans! Opposite the Windsor Hotel are a number of heritage buildings that we hadn’t noticed before and after lunch we had a little wander around. Christmas and New Year Holiday time! The only problem was that being New Year’s Eve and the holiday season the Heritage house Cultural Centre was closed for business. Normally it is managed by the South Perth Historical Society and they hold regular exhibitions of historical interest. It is also the home of the May and Herbert Gibbs Art Gallery. May Gibbs and her father Herbert were well known local artists and in 1997 a collection of 150 of their paintings and sketches were acquired by the City of South Perth, which has some more information on its webpage, “The Gibbs family were long-time residents of Suburban Rd, now known as Mill Point Rd, and many of the works in the collection were produced in South Perth”. You can also view the Gibbs collection online here if you are interested! The Gibbs collection is not always on display and you need to check the Heritage House website for up to date details. The current exhibition, which is being held until the end of January, features some memorabilia from the City Of South Perth’s local history collection. Just behind the Cultural Centre is the Old Mill Theatre! Whilst researching the local history of the area I discovered that the Old Mill in question still exists hidden away on Mill Point Peninsula, between the Kwinana Freeway and the Swan River. Somehow in all the years we’ve lived in Perth we have never come across it so will have to make amends next time. I found out that the mill was constructed 6 years after the first settlement was founded in 1829 and a few years later on the Millers Cottage was built alongside it. Now there is a Friends Of The Old Mill branch of the historical society and it can be hired out for private functions. The Old Mill is also open to the public and guided tours are available 4 days per week. However since it is manned by volunteers, opening times can be subject to change so it is best to consult the City Of South Perth information page here before visiting. On the corner diagonally opposite the Windsor you can find the Old Post Office still open for business today! From there we strolled the couple of minutes walk down Mends Street to the jetty point where the ferries shuttle backwards and forwards across the Swan River to the Barrack Street Jetty on the City of Perth side.The ferries are operated by the public transport network Transperth and you can find the timetables and further details here. The South Perth foreshore is one of our favourite spots to visit. It affords visitors a panoramic view of the city and Swan River. In the distance you can see Kings Park perched atop the Mount Eliza lookout in one direction and the Perth Hills in the other. The pathway along the river is popular with walkers, joggers and cyclists alike and there are plenty of cafes and eateries dotted about nearby. If we had continued walking west along the river path we would have come to the Old Mill but instead we turned back along Mends Street making a brief pitstop at Gelare South Perth before heading home! For more interesting and diverse walks around the world head over to Restless Jo and join her for her weekly Monday Walk! That was a BIG day out for you. et la petite aussi. Great photos. That Heritage Trail goes on the ‘to do’ list next time we head west. Thank you so much yes it was certainly a big day out indeed we were shattered by the time we got home! Now we must go back and see the Old Mill another time it sounds fascinating. Glad I could highlight some of Perth’s heritage attractions and it’s so convenient if you’re visiting at all as it’s near the city centre. Thanks for calling by here again and have a great weekend! Is that a river beach on the Swan then, Rosemay? Presumably not too far from the sea? Spectacular views across the river yet funnily enough, the same skyline as some of the Thames. Many thanks for your lovely walk! Absolutely love the look of the Hotel Windsor Rosemary – both inside and out it is just gorgeous and what a place to relax after a busy time at the zoo!! Sounds like a really interesting area historically but how nice too that just a short walk and you get those views over the water. Great post – just the thing to brighten up a grey wintery day in England! There has been some snow in different parts of the country but think it was a bit milder in London – hopefully because we are headed there for the weekend! Tell your daughter there is light at the end of the dark wintery tunnel Rosemary – the days are starting to stretch a bit, you can tell and it makes things so much better. Have a great weekend too!! I miss the blue sky 🙂 The garden looks fabulous to eat there! Hi Rosemary! Another amazing place you visit! Love the garden, the buildings, the beach, the food, the sea, everything! Looks like an relaxing place with a good atmosphere. I really hope to visit Australia once too! But I think it still be some year until it will happen. But for now, thanks for taking me on the heritage trail in South Perth. I enjoyed it! Wonderful pictures and post – it’s nice to see summery pictures since it’s winter for me! Beautiful photos! I especially love the ones of the South Perth foreshore – that water and vibrant blue sky just warm me up on this gray winter’s day! I love Perth but never got over to this part, so it looks like I will have to come back for another look. Lovely photos and such a blue sky. Hope you have a good weekend too.